Are you exhausted finding a better way to deal with employee requests for leave? Managing paper forms or emails from employees for leaves can at times be complicated and time-consuming. Docsvault’s eForms add-on can be designed to replace nearly any paper-based form in HR, Accounting, Sales, and more. 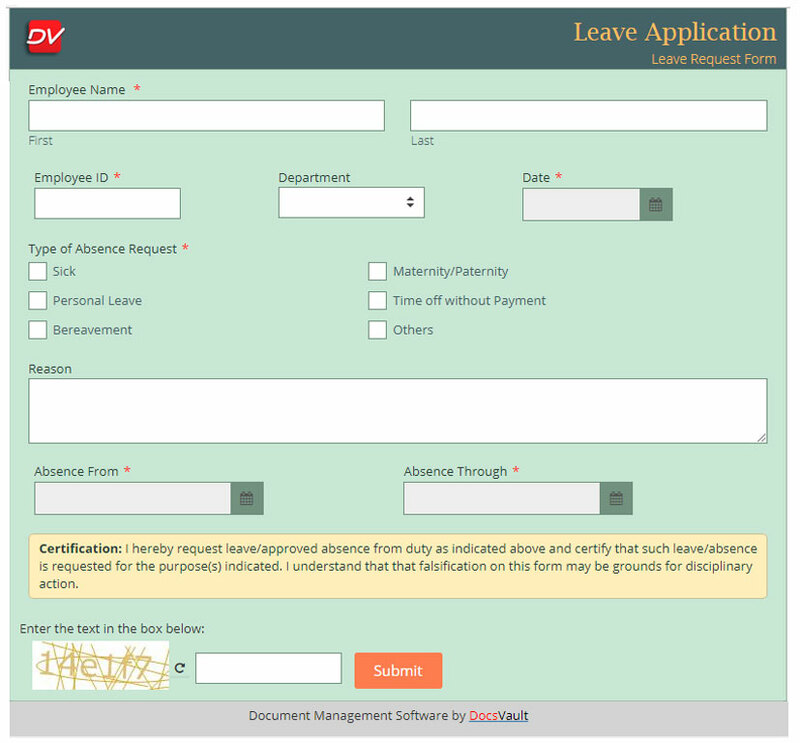 Here is an example of an electronic form used for requesting a leave. Employees who miss a work day due to an illness or emergency can inform their employer immediately. Let your employees apply for a leave directly online. Make this form available to your employees by embedding it into your website or share it internally within the organization. It becomes easy for an employee to submit their leave request application via an online form. All employee leave requests can be automatically routed to their manager for approval. Managers can approve/deny with just a click. An automatic email and popup notification can be sent to the related team members on form submissions. Employees can upload necessary support documents (say, medical reports) and digitally sign the form. This form can be converted into PDF with embedded attachments and can be saved in a specific folder that can be accessed by their manager and Human Resources. Thus, Docsvault eForms can eliminate many of the non-value adding tasks that waste time and add cost to processes for almost any department from accounting to human resources.